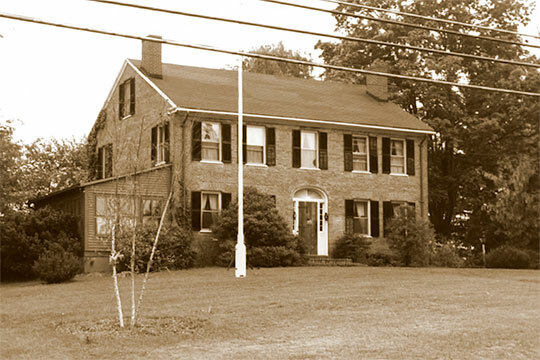 Somers Town Hall is located at 600 Main Street, Somers CT 06071; phone: 860-763-8207. Photo: Nathaniel Parsons House, ca. 1819, 521 Main Street, Somers Historic District, Somers, CT. The Historic District was listed on the National Register of Historic Places in 1982. Photographed by B. Clouette, 1979, for the National Register Historic District nomination , Somers Historic District, Tolland County, CT, (NR# 82004389), National Park Service, National Register of Historic Places, Washington, D.C.
Somers, originally a part of Enfield, was incorporated as a town by Massachusetts in 1734, and probably named for John Somers, an English lord chancellor. It was found to lie within the bounds of the Connecticut Charter and joined the secession movement. Somers was received by the Connecticut General Assembly in 1749.